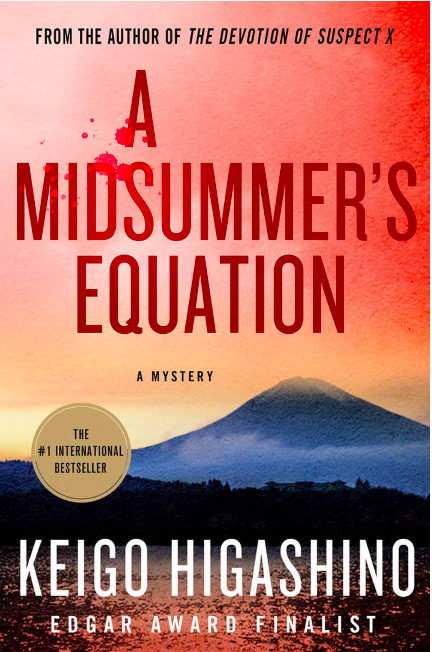 Keigo Higashino is "the most widely read author in Japan, with hundreds of millions of copies of his books sold worldwide and nearly twenty films and television series based on his work," according to the author page in my Kindle edition of A Midsummer's Equation. It's the fourth Higashino book I've read, and I continue to enjoy them for the multi-dimensional characters, the clever plots, and the local color and food descriptions. I must say, though, that this, the third available book in the Inspector Galileo series, doesn't have quite as surprising a plot as the first two did. At the beginning, we meet Kyohei, a fifth-grade boy traveling alone on a train. His parents don't want to bother with him during summer vacation, so they're sending him to a tiny seaside resort where an aunt and uncle have a small hotel. The boy is a major character throughout the story, which in itself is an innovative device in a mystery novel. Kyohei's slightly drunk father's promise to him was that the food would be good at his aunt and uncle's place: "The food’s great down there," his father said. "I’ll tell your aunt to stuff you full of fresh fish.” (p. 3). The boy and the physicist establish a very nice relationship, as Yukawa takes charge of teaching the boy some science while he's also consulting for a mining company AND helping the police. Quite a character! I was especially amused at several scenes in the middle of the book where Yukawa and Kyohei eat dinner together at the hotel. Yukawa is always served a high-end fresh fish or sushi dinner, while Kyohei has the family meal such as meatloaf, egg over a ball of rice, or pork cutlets. Eventually Yukawa requests to have the family's dinner served to him instead of the food intended only for guests. The aunt's cooking turns out to provide a critical clue in Yukawa's solution of the mysterious death of the police officer and the events from the distant past that were associated with it (but no spoilers here). 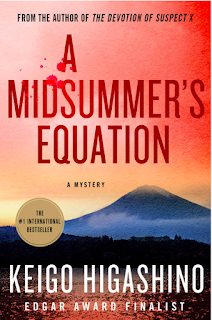 Quite a number of police officers and detectives participate in the case of the retired policeman's death, including two competing and not-fully cooperating teams from the local resort town and Tokyo. Several of their discussions take place while they are eating at a variety of restaurants with intriguing Japanese special foods -- the combination of detecting and dining is extremely enjoyable to read! "Utsumi’s favorite spot to grab a late dinner in Asakusa was right next to the Azuma Bridge, a little place on a narrow alleyway wedged in between the main road and the Sumida River. Lucky for Kusanagi, there was a parking lot just across the way. The two sat down at a table fashioned from the cross-section of a large log. They both ordered Utsumi’s recommendation: the cow tongue platter. "'Well, let’s hear it,' Kusanagi said, pulling an ashtray over and lighting a cigarette. "Utsumi pulled a navy-colored notebook out of her shoulder bag." She informs Kusanagi of her detecting efforts as they wait for their food. "Their dinner arrived. Each one of them had seven pieces of cow tongue on a large tray, surrounded by a small bowl of grated yam, a bowl of boiled rice and barley, salad, and oxtail soup. “This looks fantastic,” Kusanagi said, snuffing out his cigarette." "Kusanagi took a bite of his cow tongue and whistled. The combination of texture and taste was sublime. 'That is good. Dammit. Now I want a beer.'" "'Okay,' Utsumi said, 'I’ll try the Internet cafés tomorrow, then. We still haven’t figured out why Tsukahara was looking for Senba in the first place, though.'" "'How many years were you at Bar Calvin?” Kusanagi asked. “Twelve, exactly. ...,” Muroi said, pouring the batter out on the hot plate in front of them. There was a loud sizzle as drops of oil began to dance on the plate. "Muroi flipped one of the pancakes and said, 'It wasn’t just me who saw him. A few of the other guys at the bar were talking about it, wondering why he was so worked up.'" "'Right,' Kusanagi said, putting away his notebook in his pocket. It was over twenty years ago, as it was. He hadn’t been expecting Muroi to even remember as much as he had. "'Can’t drink while I’m on duty...' " (Quotes are from p. 170 - 174). All things considered, I love the combination of suspense, gastronomy, police rivalries, and clever characters in this novel, though I don't feel the need to summarize the story, just to give these few hints about the way the book is constructed. I'm actually a little surprised that the author, so famous in Japan, isn't better known here. I'm crazy about Higashino's books, but didn't even know this one existed. It sounds fascinating, with the mystery and the food in Japan. I wish I could eat there in person. I'll add your review to the list on my blog, you're the second person to leave a link so hooray! I've read one of his books which I enjoyed & my wife absolutely loved. Can't recall the title but I reviewed it a while ago. Everyone Knows that Vegetables are Good For You!